Aaron Becker has worked as an artist for such film studios as Lucasfilm, Disney, and Pixar, where he helped define the look and feel of characters, stories, and the movies they become a part of. With Journey, he has created characters and worlds of his very own, using traditional materials and techniques. Aaron Becker lives in Amherst, Massachusetts, with his wife, daughter, and cat. This is his first book. An imaginative adventure story whose elaborate illustrations inspire wonder, careful examination and multiple reads. Wonder mixes with longing as the myriad possibilities offered by Becker’s stunning settings dwarf what actually happens in the story. Readers will be both dazzled and spurred on imagined travels of their own. [An] auspicious debut... [a] captivating wordless story... The strong visual narrative makes this an appealing choice for a wide range of ages. By the turn of the last page, children will immediately begin imagining the next adventure. First-time author Becker sweeps readers away on the very best kind of journey, allowing a complex color scheme, intricate fantasy environments, and a stirring sense of adventure to tell the story without a single word. ... Laudable for its adventuresome female protagonist, scope, and sense of fun, this title will draw girls and boys back to it again and again. There is much to pore over in the watercolor and pen-and-ink illustrations, and when the boy and girl ride off together at the end on a tandem bicycle with one red wheel and one purple wheel, readers will want to follow them. This is a wordless picture book that will be transcendent for readers and appeal to a wide variety of children. ... This is a beautiful tale that will visually delight for years to come. We live in a time with a lot of flash and beep and tweets. Mr. Becker has made a beautiful reminder that there are times we need to turn it off. Sometimes we need a book, some quiet, and our imagination. It's so well done. I fell into this breathtaking adventure and didn't want to leave. This is a book of extraordinary magic and beauty. [A] gorgeously illustrated, imaginative take on the wordless picture book... It’s a true feast for both the mind and eye! Dreamlike... Like Harold and his purple crayon before her, the child discovers that she can use a crayon to make an imaginative escape — and what an escape it is! ... Dazzling. [A] wordless tour de force... Completely original. ... Becker's breathtaking urban and bucolic scenes map out a visual narrative that reflects the girl's journey—both external and internal. ... Here's hoping there's more to come from this talented newcomer. Talk about making your own adventure! ... [E]xtraordinary kindness and a couple of crayons produce an ending so original and satisfying you can’t but shake your head and smile. This gorgeous, wordless book is a gem. 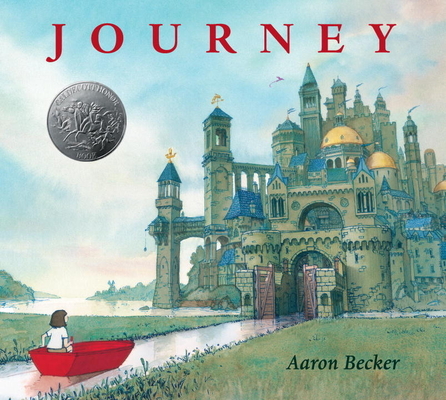 [A]n absolutely magical tale... Becker's picture book is one of the finest get-lost-in-your-own-imagination tales of loneliness, escape, adventure, and, ultimately, new friendship that I've read in quite some time. Becker launches readers into a wordless adventure amid exotic lands and narrow escapes—thanks to the bright red marker-wielding heroine. Think Crockett Johnston’s ‘Harold and the Purple Crayon’ crossed with Neil Gaiman’s ‘Stardust.’ A lonely girl steps from her black-and-white world into a vast, colorful journey. Some stories, including this one, don’t need words to fire the imagination. With its fine attention to detail and jaw-dropping storyline, Becker has created a modern day classic in the midst of an overpopulated genre. ... I don’t get to use this word very often when I’m talking about books for young children but I’m going to dust it off and use it now: Beautiful. There’s no other way to describe Journey. This absolutely gorgeous wordless picture book is a testament to the skill of author/illustrator Aaron Becker. As Journey ends, you'll want to immediately return to the beginning to experience it again. A lonely girl takes her red crayon, draws a door on her bedroom wall and walks into a world of steampunk flying machines and turreted canal cities. She navigates this fantasy realm via boat, balloon and flying carpet, all drawn with her crayon. Journey is a clear nod to Crockett Johnson's Harold and the Purple Crayon, but this version doesn't have words; instead Aaron Becker tells his story through meticulous watercolor and pen-and-ink illustrations. Becker's wordless masterpiece is both timely and timeless, drawing inspiration from the classic "Harold and the Purple Crayon" to draw the reader into an entirely new and beautifully-rendered world. Worldless picture books are nothing new, but it takes a special touch to create one that appeals to both pre-readers (have them "narrate" their own story to you as you leaf through) and older students who can appreciate the layers of silent storytelling. 'Journey' accomplishes this feat and just might be the perfect title for one last summer roadtrip ... Film illustrator Aaron Becker's creation is at once simple and nuanced, a beautifully tactile version of the best Pixar shorts. With this wordless tour de force, Aaron Becker gives a nod to the likes of Crockett Johnson and Shaun Tan—but in a completely original work. … Becker's breathtaking urban and bucolic scenes map out a visual narrative that reflects the girl's journey—both external and internal. By the conclusion, readers see that all she needs is a likeminded friend. Here's hoping there's more to come from this talented newcomer.